Audrey Woodhams is a Dove Award-nominated songwriter with more than 1.5 million sales worldwide. A graduate of the School of Music at Belmont University in Nashville, TN, Audrey released her first album to a full house at Nashville’s legendary Exit/In and became a staff songwriter for BMG Music Publishing. A songwriter for more than 20 years, Audrey has recorded 5 albums and co-written with songwriters and musicians from all over the world. Now teaching songwriting in Milton, Massachusetts and via skype, Audrey is here to help you develop your voice and songwriting talents. Are you a beginning vocalist, wanting to find your natural singing voice? Are you interested in commercial voice lessons, finding your own vocal style in Country, Pop, Folk, or Rock music? In this fun, encouraging setting, students learn and develop vocal skills (diction, breathing, pitch control, etc.) and then use what they’ve learned to sing the popular songs they love. Ages 7+. Weekly 30-min sessions, $152 per month or $40 each session. Interested? Click here to find out more and schedule a free consultation. Students learn to play guitar in a step-by-step easy method, developing their ability to read music and play chord progressions of popular songs. Ages 7+. Weekly 30-min sessions, $145 per month or $38 each session. Note: This class is usually held at Mel O Drama, but scheduling this session has led us to bring the class to Audrey’s home studio at 168 Brush Hill Road #1, Milton. Date/Time: TBA…send us an email, and we’ll notify you as soon as the date is confirmed! In this 3-hour workshop, we listen to our favorite Taylor Swift tunes, learning a couple of songwriting tricks and techniques that make her albums so great. Then we’ll use what we’ve learned to pen our own song together. This workshop is great fun, and sells out quickly! Songwriters learn new chords each week, and then we use what we’ve learned to write fun chord progressions and songs of our own! Do you have notebooks of song lyrics, or pieces of melodies, but are you not sure what to do with them, or how to make them into full-fledged songs? Do you want to develop your songwriting craft and find your audience in your community? In private songwriting lessons, we study our favorite songwriters to learn the tricks and techniques that make a song great. 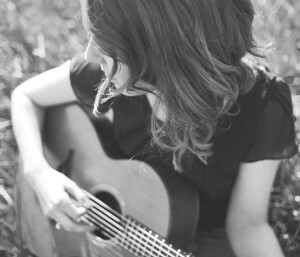 In an encouraging setting, a student learns the songwriting craft and develops her own songwriting style. Private songwriting lessons are $75 for a 45-min session. Want to bring a friend? Semi-private lessons are $35 per student for 2-3 students. A class for 4 or more students is $25 per student. Interested? Click here to find out more and schedule a free consultation. Interested? Questions? Fill out this form below, and let’s get in touch.